All sins, my dear girl, are brought here by the hot south wind from out of the desert. Where the sun burns through endless centuries there hovers over the sleeping sands a thin white haze that forms itself into soft white clouds that float around until the desert whirlwinds roll them and form them into strange round eggs that contain the sun’s blazing heat. There the basilisk slinks around through the pale night. In a strange manner the moon, the eternally infertile moon, fathered it. Yet its mother, the desert sand, is just as infertile as the other is. It is the secret of the desert. Many say it is an animal but that is not true. It is a thought that has grown where there is no soil or no seed. It sprang out of the eternally infertile and took on a chaotic form that life can not recognize. That is why no one can describe this creature. It is fashioned out of nothingness itself. 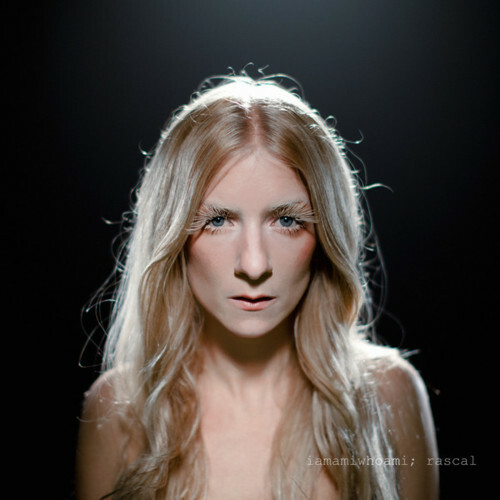 It’s hard to describe in words what iamamiwhoami manages to describe through choice of scenery, face expressions and body language, but what I see and feel with rascal is the dryness of the soul tormented by empty hunt, the thirst of the body drained by arid loss, the perseverance of the mind driven by yen of self discovery and self healing. The simpler the videos get, the more they speak to me, and the more they make me ask other and other questions. Rascal begins where idle talk ended and, even though I was expecting a beach, this desert seems to fit better in the story. MO is crawling on the sand, her moves slow and demanding, accompanied by the heavy sound of a drum, similar the beat of a funeral. Speaking of audio, notice how the incipient sounds, just like water getting drained from a container. And then like sand taking over. Dryness ahead. She’s either running from something, or run towards something. The farthest one can come too close could refer to someone following her, reason for which she risks the dryness of the desert just to escape it. What if we’re dealing again with two different MOs? It’s very possible. The first one is band aid MO and the second one is white gown MO. Or… again, the two sides of her self, which would explain life could be better if I let me in. I like this option better because it’s like a process of healing we’re witnessing. First she’s covered in band aids, crawling, barely moving ahead, she often stumbles, sits for a while to take her breath and so on, while, towards the end, she loses her band aids (a sign of wounds healing, whatever those wounds are) and she even manages to escape sand and find a rocky field. Rocks, as opposed to sand, suggest stability. They cannot be moved, like sand. And it’s MO’s face expressions and even lyrics that suggest exactly that. She’s drained, but she’s found the way out of the desert, so she’s turning towards us, looks the viewer right in the eyes and… well… she looks like she’s threatening. Her face promises some sort of revenge. She looks stronger now. Her gesture in the end, when she sits on a rock and she looks beaten, that’s not her being dismayed by not finding something, that’s her breathing out in relief and resting her body after having reached a cross line. What came into my mind these days, right after one of my readers posted a comment, is the fact that we must not forget about what happens in sever, what sever means in the end and what MO portrays in that video. Everything after sever makes sense if we keep in mind what it means. The presence of the clumps, the presence of multiple MOs (most of the times in opposite pairs) and so on. If she’s a patient in a mental institution, sever depicts a split in her mind, drops depicts a major downfall and the start of a battle, the fight a mentally disturbed (depressive, anxious etc) individual bares inside himself, good worker presents an inner dialogue (even a submissive patient, why not, one analyzing the use/benefits of treatment), play portrays the extent of self control loss (plus applied techniques to cure the split – electroshock), in due order shows the power of a balanced mind (the power of treatment), idle talk is the effect of balancing, a want for coming back, rascal represents the devastating effects of the applied cure (a wiping of memories/imagination/harming thoughts – the clumps turned to dust and that desert sand she’s wandering in) and the hard process of healing. Hopefully, kill will portray the end of the split in sever, hopefully something will be left behind forever. At this point, all the sand in rascal makes sense. Sand is flat, dry, uniform. The mind of a mentally disturbed person after having taken medication. Empty. Full of vast nothingness. Yet in continuous, assiduous search. In the first images, we even have the impression MO’s going. Right there, when she stops, her face planted in the sand, her hands unable to raise her body up. That’s he mind close to being completely erased. Yet she gets herself up, and starts rebuilding memories, she starts searching, wandering through the dunes. Light plays an important role in rascal. To me it’s like I am witnessing at what MO does during a day. The video starts in darkness (twilight) and ends in dimness (dawn), its middle very luminous. The cycle of the sun, if you want, crawling from darkness to light, an allegory of the process of healing, again. The very first time I heard about the title of this track being released I hoped it would somehow take me back to the beginnings and here it is. To me, rascal describes Mandragora herself. It’s the ‘it’s me’ here. She’s the one molded like she’s shaped in size with anyone (the androgynous appearance of the plant). She’s the one who forces herself towards departing (always trying to run from her catchers’ grasp) and the one who would take all when she cannot do that (killing those who keep her captured and those whose object of affection she becomes). Check out 202ok’s amazing audio analysis of rascal here. Makes things so comprehensive!